RACINE—Margaret Rose Williams passed away April 14, 2019, surrounded in love from her sisters and her children. Margaret was born in Racine June 17, 1931 to Mihran and Vartenie Dadian, was raised in a loving Christian family and Armenian community, her foundation throughout life. After graduating from Horlick High School, she worked at Webster Electric where she met her loving husband Richard E. Williams. They shared 58 years of marriage before his passing in 2013. 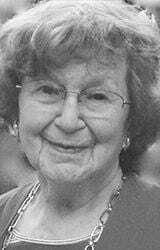 She was a member of the St. Mesrob Women’s Guild, the former Racine County Homemakers, and retired teacher’s aide from Fine Arts School, where she loved working with children. Her greatest joys in life were being a wife, homemaker, mother and grandmother. She was happiest when others were happy, always concerned for their needs before her own. She will be remembered for her gentle smile, kindness in her eyes and friendly personality. Survivors include her children, Mary Jo and Michael (Melissa) Williams, much-loved grandchildren Brendan, Nathan and Ella Williams, sisters Mary Akgulian and Shockey (Don) Julie, special cousin May Ann Injasoulian, sisters-in-law Margaret B. Dadian and Mary Gross and her blessings of many nieces, nephews and close cousins. Also preceding her in death were her parents, her beloved brother Charles G. “Chuck” Dadian, brothers-in-law Mark Akgulian and Leon Gross, best friends Susan E. and Katherine K and loved Taktakian cousins. Funeral services will be held Wednesday, April 17, 2019 at St. Mesrob Armenian Apostolic Church, 4605 Erie Street with Visitation at 9:00 a.m. until time of service at 10:00 a.m. with Father Avedis Kalayjian officiating. Interment will follow in Graceland Cemetery. In lieu of flowers, memorials suggested to St. Mesrob Church ACYOA youth group. The family would like to thank the Ascension All- Saints nurse team, Shelia RN and Grace Hospice for their excellent care. There are not enough words to effectively thank Margaret’s entire Primrose Retirement Community Family for their genuine compassion, outstanding care and friendship. She loved you all.